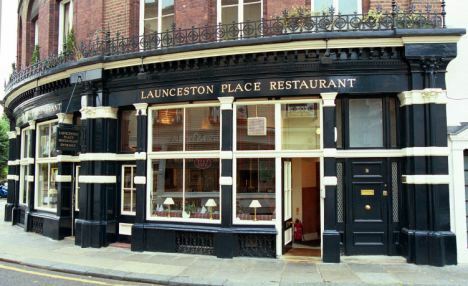 On a recent visit to London, I revisited Launceston Place, a great restaurant I’d tried on my last visit two years ago. The former chef has moved on, but the food, wine and service held up to my expectations. The atmosphere is calming and relaxed. 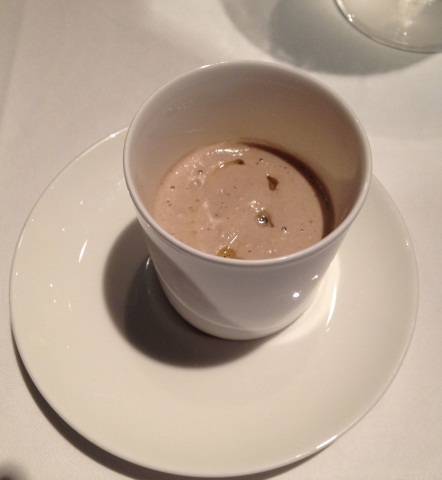 We enjoyed the Tasting Menu, which started with an amuse bouche – mushroom foam with crushed hazelnuts and hazelnut oil. The first course was slow cooked duck egg with cured foie gras, “airbag bacon” (which I assume means it was cooked sous vide), and English asparagus velouté. All very tasty, although I remain a holdout against sous vide cooking. Meat should have a sear on it! The usual next course is roasted scallop, with glazed pork belly. 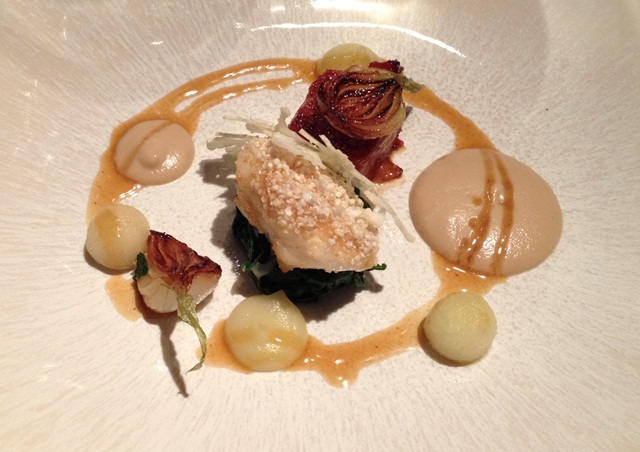 We requested a change to monkfish with pork belly, spinach, and onions. I know that when a top restaurant does monkfish right, it is exquisite. This was perhaps the only error of the night – the monkfish was a bit overcooked and dry. Everything else on the plate was wonderful. 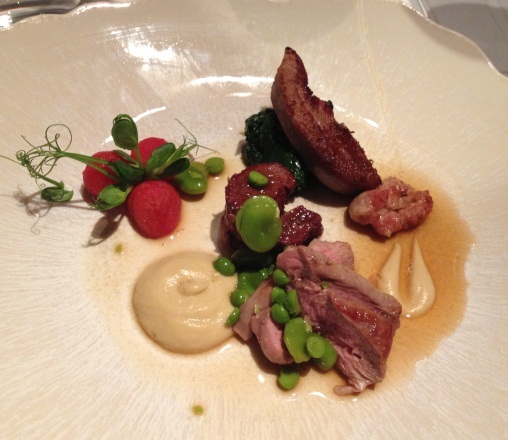 The next course was new season English lamb served four ways – loin, neck, tongue and sweetbreads, with curried cauliflower, cherry tomatoes, fresh peas and broad beans. This was wonderful, and served with a Barossa from Australia that tasted like Chateuneuf-du-Pape. My selection of English and French Cheeses included Pont le Vec, a Camembert with Calvados, Aged Cheddar and Stilton. The cheese was accompanied by a Syrah from Chile. 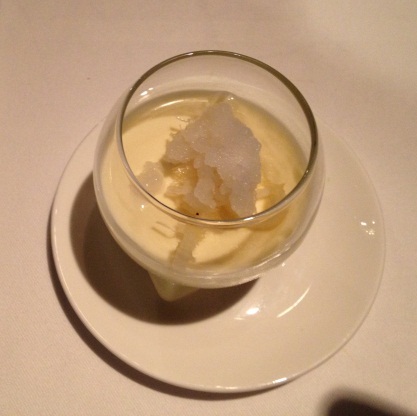 Next was a palate cleanser of confit lemon and rosemary granita. 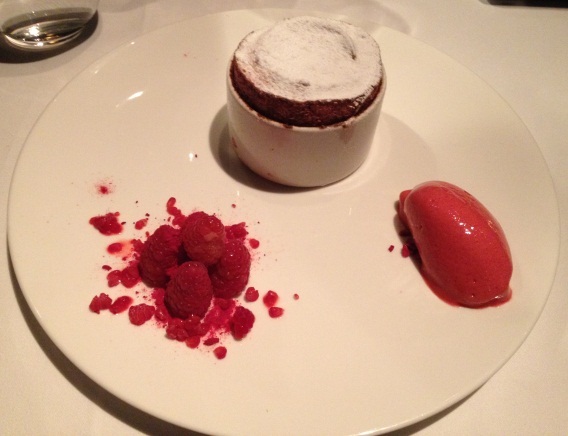 Finally, dessert was Early English raspberry soufflé with white chocolate cream, frozen raspberries and raspberry sorbet. After 3 hours had gone by, we finally noticed that time had passed. This is a testament to how wonderful the service was – we were delighted to have been their guests for this amount of time. I originally started this blog in June, 2010 to record all the wonderful food experiences we had on our European trip. I now have steady readership of about 500 people a month, and post restaurant reviews, recipes, and items about locavore and quality eating! And a drink here and there. Thanks to all of you for your support. To celebrate one year of food blogging, I’ve inserted a slide show of some of the food we ate in Europe last year. 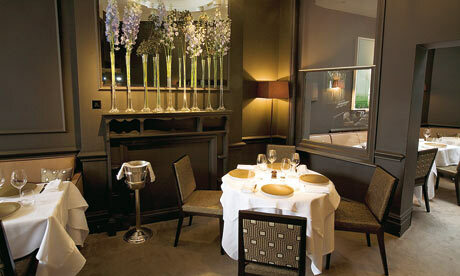 We had an extraordinary 7 gourmet tasting menus in London, Paris and Amsterdam, plus other really good meals. To read those original restaurant entries, go back to the archives and look at June, 2010.